Ive been looking into this a ton the last month or so. Reading and watching everything I can. I’ll probably be picking a kestrel in the off season along with a predator platform. Then I’ll use my LW sticks for run and gun. But I’ll probably preset some trees with screw in steps. There is a forum specially for saddle hunting you guys can get some good info from. Along with G2 outdoors on YouTube. He has some really informative videos. Yes I'm a member there also. All the info you could ever ask for! That setup you described will work just about anywhere. I highly suggest finding someone that has the setup, it is unique and alittle bit of a learning curve. Be nice to try before you purchase. Also give a idea of everything you will need. Comfort is the hardest thing to achieve, but is all done thru your setup, so lots of adjustment to see what fits you best. Yeah I looked around and haven’t seen anyone around me with one. But I’m pretty confident that I’ll enjoy it. So I’m okay with going in blind so to speak and spending the money. If you have a spare life line around you can make your tree tether and linesman belt with it. It saves you alot of money from buying the whole kit. And it's really easy to do. Also buy a ropeman 1, you can thank me later. S.McArthur and virginiashadow like this. I like this more and more. full bow season in the Mantis so far. Its awesome. I own 3 lone wolves and not one of them has been on a tree this whole season. I'm either hunting preset trees or carrying sticks. I may never hunt from a tree stand again. its wwwwwwwaaaaaayyyyyy lighter than any other gear. I'm trying to think of a simple climbing system with this. I like things simple. 3 climbing sticks cut to 20" - 24" and a 1 step webbing aider on bottom of each one is all you will ever need. Very fast and clean way to get in tree. If you need more height, just do one stick method up as far as you need to go. I can tare down and pack up in less then 5 minutes and be sneaking out in no time. So, I've watched a buttload of videos and it seems pretty straightforward. Tethrd has a "starter kit" for $300 w/o platform. I am going to do some more reading on this but it seems it would work pretty well for my public land stuff. Either way, I am still going to have to buy climbing sticks whether I choose the saddle or lock-on. I was in some super duper thick stuff this year and the harness would have been great to use in the pine trees and put me in a prime area. Plus, I still feel like a kid when I climb trees. Saddles are the way to go vs hanging and hunting. 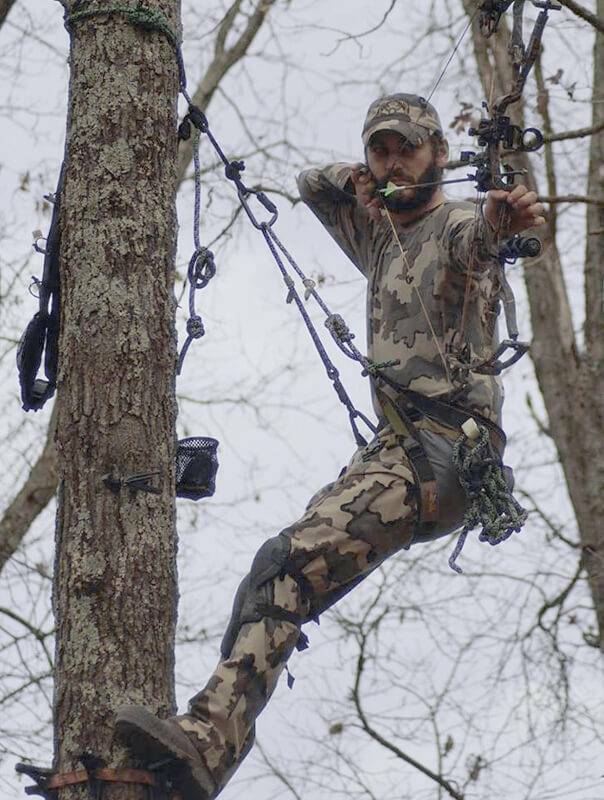 If stands are pre set ...fine walk up and hunt buy if not and carting them in a saddle and stick set up will save you the weight of the stand. It's a good option to have. I really like the idea. I'm trying to understand the comfort level though. There is no back support on Brett's picture he posted. I understand you can adjust the height of the saddle to relieve pressure on your feet from standing, to be more sitting. All I can picture is for total relief is to hump the tree....LOL I'm watching a bunch of youtube videos trying to get a handle on everything. I'm still leaning towards a LW assault hand climber at 15 pounds. I'll be biking in to all the deep spots next year so carrying a stand far distances won't be a problem anymore. Keep the talk coming though..I'm all ears! ahhh the kestral back strap. I bought the whole mantis kit with the backstrap. Don't even need it. I spent 8.5 hrs in a tree the other day in complete saddle comfort other than getting cold. go to saddlehunter.com to learn everything about saddle hunting. Also G2 outdoors as above has great videos. I tried Tree Saddle a few years ago before it was the new fad thanks to some social media posts. I hate them. And I can't say that with enough vigor LOL. I need to shift constantly when using one to stay comfortable (3 back surgeries). I liked the idea of saving weight but I'll stick to my Lone Wolf stands where doing things like turning to shoot, taking a pee, or changing layers isn't an adventure . What saddle did you have? A lot has changed in the last 2 years. Hey guys, I'm going to start saddle hunting soon, I'm going to upgrade my pack to accommodate carrying my sticks( 4 hawk helium's) on the outside and my gear and predator platform inside. I've been looking horn hunter packs.. anybody using something now that works well. I'm used to carrying my hang on or climber with a small pack.